UPDATE: It’s Live! Read more here. 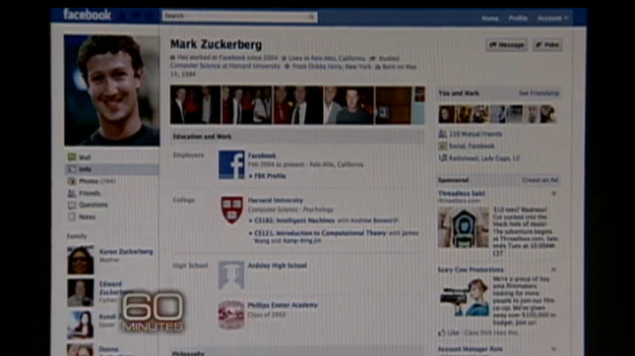 Facebook’s Mark Zuckerberg is on 60 minutes tonight and has given the show an exclusive look at the social network’s new profile page. There’s little to go on until the show airs tonight at 7 p.m. PT., but you do catch a glimpse of the profile page design changes a few seconds into this video. Interviewer Lesley Stahl also sneaks in that the design will go live tomorrow. The new look gives “poke”, something I at least thought was dying quietly, a far more prominent position alongside the message button. Photos are also now positioned directly under the profile name and basic information about the individual. You can see Facebook Questions has been given its own link in the sidebar along with wall, info, photos, friends and questions. With just the one dark screenshot, there’s little else to go on unfortunately but if Ellen’s fan page is a sign of things to come – it should be a much cleaner look. This is yet another update from Facebook in as many weeks, clearly their lock down period has proved fruitful with launch of Places, new Facebook photos, Groups, deals, acquisition of Drop.io, hiring of Google Wave’s Lars Rasmussen and now this. If you can’t watch the video, watch it here.